­ Please read and review the Consignor Agreement at the time of registration and accept the terms before registering and entering items. ALL CLOTHING ITEMS MUST BE STAIN-FREE AND ODOR-FREE! Please wash your clothing and inspect it before hanging it and bringing it to the sale. Any clothing with stains, or with missing buttons, rips, holes, etc. will be returned to you at drop off. Please CLEAN ALL TOYS, INSERT WORKING BATTERIES, and CHECK PUZZLE PIECES before getting started. Please Note: Consignors with a high number of items that are rejected at check in, pulled from the sales floor, or returned during the sale for quality will be blocked from participating in future sales. Thank you in advance for helping us to maintain our high quality standards on items we accept for consignment! Wire hangers ONLY! PLEASE NOTE: no plastic hangers whatsoever! It helps if you gather similar items together in piles beside your computer before you start entering. Gather all of your boys 4T, girls 3T, books, etc. Be sure your items are CLEAN, that they meet current requirements of the Consumer Product Safety Commission (CPSC), and are not on any lists of dangerous or recalled items. Check the Product Recall Search page of our website carefully, as O!baby Children’s Consignment Sale will not be held responsible if consignor fails to meet these requirements. You are now ready to log in to your consignor account and choose “Work with Consigned Inventory” under Activities. Be ready to answer the following questions about each item you will enter: CATEGORY (from pull down menu; won’t display on tag). PLEASE BE SURE TO ENTER ALL CLOTHING ITEMS UNDER “CLOTHING/BOYS, GIRLS, ETC.” NOT UNDER ACCESSORIES. WE DO NOT COLLECT SALES TAX IN COLUMBIA COUNTY ON CLOTHING AND SHOE PURCHASES UNDER $110 AND IT IS IMPERATIVE THAT YOU SELECT THE CORRECT CATEGORIES FOR YOUR ITEMS! DONATE: YES (if you wish to donate your item.) This will appear as DONATE: NO if you do not. Check as appropriate when entering your items. PRICE (you decide, in whole dollar increments). TWO DOLLAR MINIMUM FOR ALL HUNG CLOTHING ITEMS. DISCOUNT? (Again, check, as appropriate. Note that furniture and cribs cannot be marked DONATE.) On the tag, donated items will have the word DONATE: YES in the bottom left corner. The tag will also indicate whether the item is to be discounted (1/2 price) during the discount day or days of the sale. Tags print 6 to a page. Please give some thought to these categories before you start entering items! Visit our Pricing Tips page for some general guidelines on pricing your items to sell. Use the two lines of description to your advantage! Is your item “NWT” (New with Tags), “Hardly Worn,” “Too cute!” SELL IT! Remember that items marked DISCOUNT will go on sale at 1/2 price during our advertised “Half Price” day or days of the sale. If you don’t want to have your item discounted, please don’t check this box. If you wish to have your item(s) DONATED to charity at the end of the sale (rather than pick them up), please remember to check this box as well. Remember to only enter items that are seasonally appropriate for this sale, i.e. spring/summer for Spring Sale, fall/winter for Fall Sale, in good to excellent condition, and free of any odors (smoke, pets, etc.) Please see the ACCEPTED ITEMS on each sale page for more information and our clothing guidelines. PLEASE: There is a $2 minimum for all hung items. Insert card stock (60 or 67 lb, white, off-white or light gray ONLY, no colored cardstock) into your printer. Click on WORK WITH CONSIGNED INVENTORY and scroll down to PRINT TAGS. Remember to disable pop up blocker on your browser or your tags won’t print! Print all tags or just certain tags. Tags will print 6 to a sheet. Cut tags carefully with scissors, or a paper cutter. If you make a mistake while printing your tags, please print a new tag. Do NOT print on both sides of the card stock; please print on one side ONLY. Once you have printed your tags you are now ready to affix them to your items. Hang clothing on a WIRE hanger ONLY, with hook pointing to the left (like a ?). Bend the hanger sides DOWN (not “back”) for smaller sizes, if needed. For single items, its preferable to also place safety pins on the shoulders, securing the item to the hanger. Secure all buttons, snaps, zippers, etc. ALL TAGS ARE PLACED ON THE LEFT SHOULDER OF THE GARMENT (OR THE RIGHT HAND SHOULDER IF YOU ARE LOOKING AT IT.) Do not place tags on the hanger. Use a tagging gun to attach barbs to the INSIDE TAG of the garment or THROUGH THE SEAM (neck or “under” arm seam.) Do NOT tag through the clothing itself, as this will leave a hole. Pin the shoulder of the garment to the hanger, especially if the item may slip off the hanger easily. 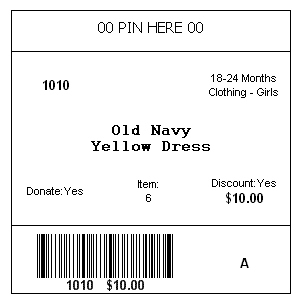 Special Note: CLOTHING ITEMS THAT ARE PRICED AT $15 OR ABOVE MUST HAVE THE TAG SECURED WITH A TAGGING GUN, NOT A PIN. 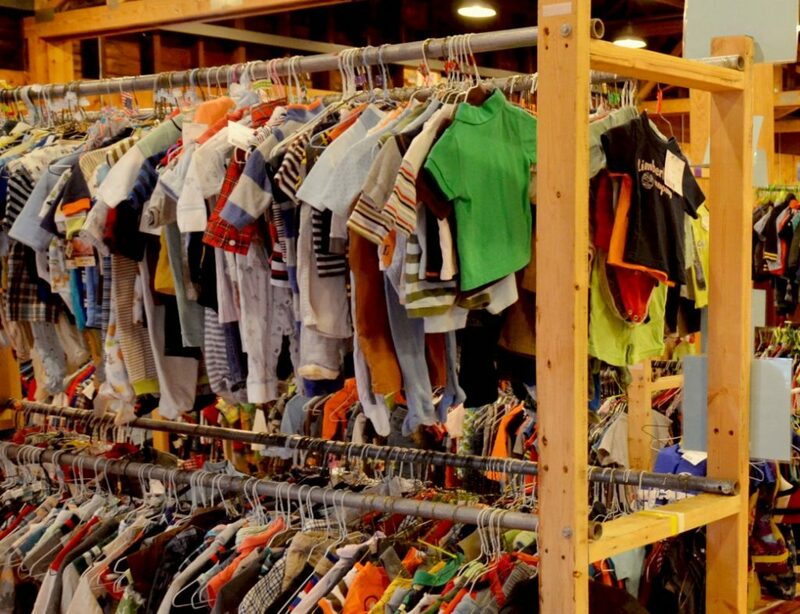 ITEMS WILL NOT BE ACCEPTED FOR CONSIGNMENT IF THEY DO NOT CONFORM WITH WITH THESE GUIDELINES. Remember: only one item or one outfit per hanger! If you have two pieces, (ie: two t-shirts, or two pairs of pants) that is acceptable, as long as both items can fit on one hanger, with only one tag. To hang two items correctly you will need to hang or pin the first item, then turn the hanger over (“flip it”) and pin the second piece to the back of the hanger, facing out. This will allow us to inspect both items at drop off, and helps the shoppers as well! 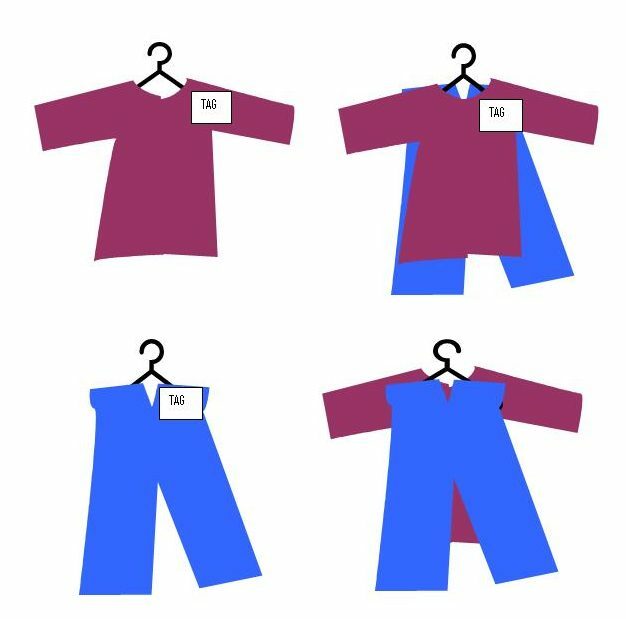 For three pieces (a “3 piece item” would be most likely with infant clothing/outfits, for example something with a small jacket) – first hang the shirt, then place the jacket over the shirt and flip over to pin pants to the back. See example illustration below. Consider putting a piece of MASKING TAPE on the inside collar or waistband with your consignor number, item number and price. Again, if a tag becomes separated from an item, this information will help us find the item for you in the computer quickly and sell it! We recommend that you place books, toys w/small pieces, lamps with shades, or any other items that can become separated in a large zip loc bag and tape the top; affix tag with tape, but do not tape over the bar code. Use packing tape only (scotch tape doesn’t stick) and you may also pin the tag if you like. Consider using a piece of masking tape with consignor number/item number/price in case the tag becomes lost. Use enough tape to secure the tag on your items, but be careful that they won’t be “ruined” when tape is removed. Please pay special attention to how you package puzzles! Do NOT tape down wooden puzzle pieces! Instead, bag them in a large 1 or 2 gallon zip loc bag, OR use Saran Wrap, NOT “Press and Seal” (wrapped around the puzzle and then taped) to be sure all the pieces stay together. PLEASE DO NOT BAG SHOES! Review our new procedure on how shoes should be prepared for the sale. The very smallest sizes (ie: infant shoes) may be bagged, but older sizes should be zip tied together (use a hole punch and place the tag in the middle of the zip tie.) Shoes should be CLEAN, DRY, and the EXACT SAME SIZE. You will also need to include your consignor number, item number, price, and whether the shoes are DISCOUNT/DONATE on masking tape and affix tape to the bottom of both shoes OR on the inside heel or bottom of the shoes. This will help us sell them for you in the event that the tag becomes separated. Whenever possible, shoes should be zip-tied together. Hats, scarves, etc. should have the tags affixed with a tagging gun (again, through the seam, top or tag as not to damage the item), and then bagged. Seal the bag with heavy duty packing tape. We will scan the bar code through the bag or open it at checkout, if needed. Remember, there is a $2 minimum on all items. All items should be priced in $1 increments ($2, $3, $4, etc.) If you wish to sell something for $1 you should check “discount” or group your items (ie: books) together.